Enlightenment is the primary goal of every Hindu temple. Architectural styles, towering gopuras, magnificent sculptures, paintings, carvings and decorations of world famous temples are truly a feast to the eyes. Here the list of 10 largest Hindu temples in the world. Vaitheeswaran Koil is a Shiva temple located in Tamil Nadu State of India. This temple is named after Vaitheeswaran, one form of lord Shiva. Vaitheeswaran Koil is also one of the Navagraha stalams in India which represents Angaraka (Mars). It is believed to be some of Shivalingas of this temple have been worshiped by Lord Rama, Lakshmana, Surya and the vulture king Jatayu. The temple has five main gopuras and enormous enclosures. There are metal images and stone sculptures of Lord Subramanya, Surya and Durga within the precincts of the temple. The devotees believe that holy water and sacred ash of this temple have power to cure many diseases. The enormous Meenakshi Amman temple is a symbol of Madurai city and an outstanding example of Dravidian architecture. This large Hindu temple dedicated to Lord Siva and Goddess Parvathy or Meenakshi. The lord Siva also called as ‘Sundareswarar‘ in Madurai. This large temple complex covers an area of 17 acres. There are 14 ‘gopuras’ or pyramidal gates rise to a height between 40 and 50 meters. The four of tallest gopuras of the temple stand as entrances and smaller gopuras direct to the main shrines. The gateway towers of the temple facing four directions. Visitors usually prefer Eastern entrance of the temple as it open to the main shrine. The Multi-Storeyed gopuras of Meenakshi temple also carved with figures of animals, Gods and demons. The Madurai Meenakshi temple was originally built by Pandyan king Malavarman Kulasekara Pandyan in 13th century. 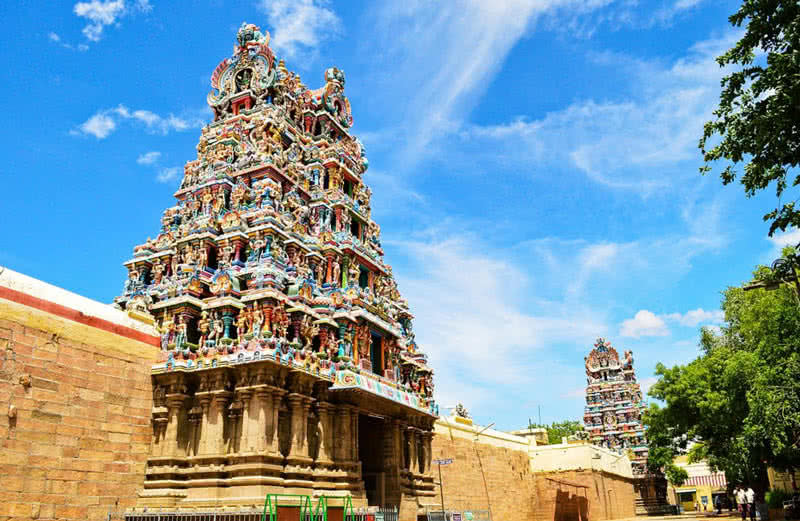 In the 14th century, Meenakshi temple was sacked by Muslim invader Malik Kafur. Later, the temple was rebuilt by Nayak ruler Viswanatha Nayakar in 16th century. He redesigned the temple in accordance with the principles of ‘Shilpa shatras‘, an ancient Hindu texts of arts and design. The central shrine of Meenakshi temple dedicated for Sundareswarar (Lord Shiva) and Meenakshi (Goddess Parvathy). The sanctum of Meenakshi and Lord Shiva is covered with golden plates. The main sanctum of temple is also surrounded by a number of other shrines. The ‘Mandapam’ of Meenakshi temple contains 985 unique pillars made of granite. Some of the pillars produce music on taps. There is also a art gallery in the temple that displays drawings, photos and icons that illustrate ancient Indian temple architecture. The Jambukeswarar or Thiruvanaikaval Shiva temple in Tiruchirapalli of Tamilnadu is one of ‘panchabhoota sthalams’, means one of five Shiva temples that represents five great elements (land, water, air, sky and fire). The four Shiva temples of ‘panchabhootha sthalams’ located in Tamil Nadu and one in Andhra Pradesh. 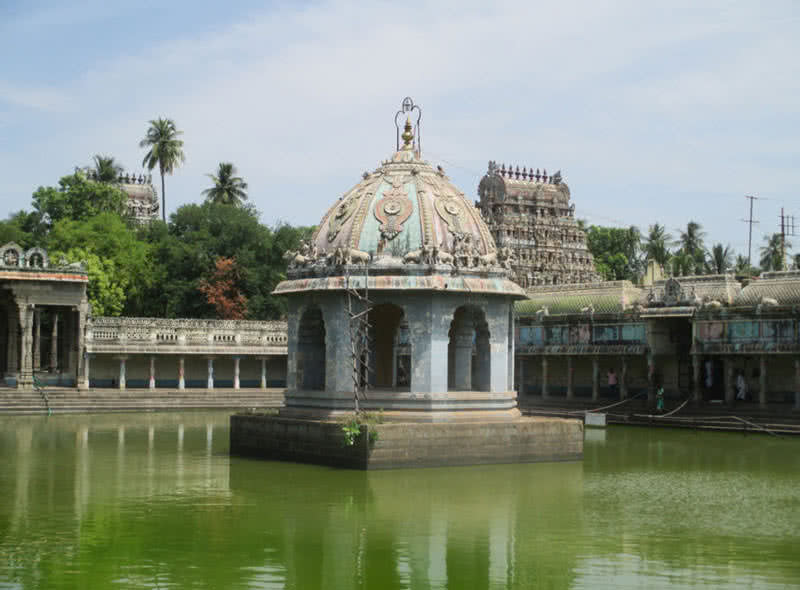 The Thiruvanaikaval temple represents ‘water’. The main sanctum of the temple also has an underground water stream. The main deity of the temple is Jambukeswarara, one form of lord Shiva. According to mythological believes once Akilandeswari (Incarnation of Goddess Parvathy) came to this place from ‘Kailasam’ (mount kailash) to conduct penance. She made a lingam with water of Kavery river. 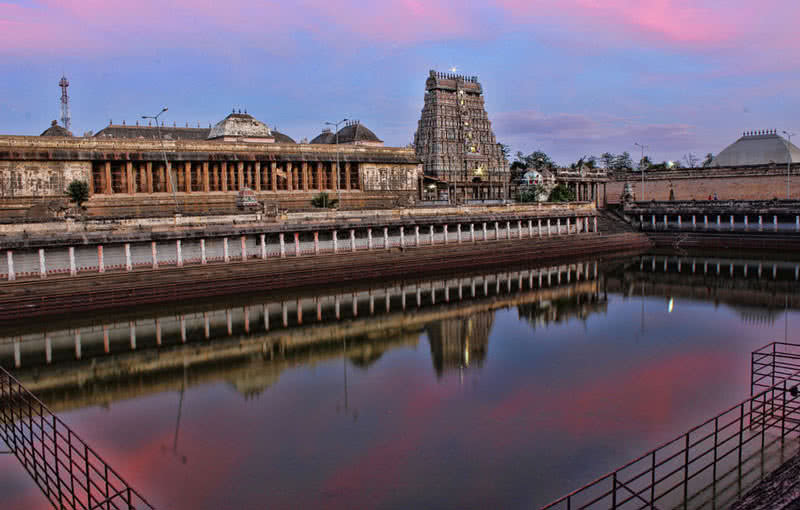 That’s why Thiruvanaikaval temple represents water or neer, one of prime elements of nature. The Shiva lingam of Thiruvanaikaval temple is known as ‘Appu lingam’ means lingam made of water. The Thiruvanaikaval temple was built by the emperor Kocengannan Chola in 1st century. The temple also contains inscriptions and sculptures from Chola period. There are five enclosures in the Jambukeswarar temple complex. The enormous outer wall of the temple complex known as vibudhi prakara has a length of 1 mile and a height of 25 feet. The fourth enclosure of the temple contains 196 pillar. There is also a small tank that fed by natural springs. The central precinct has two gopuras at 100 feet and 73 feet high. The main shrine, appu linga can be found at inner precinct of the temple. 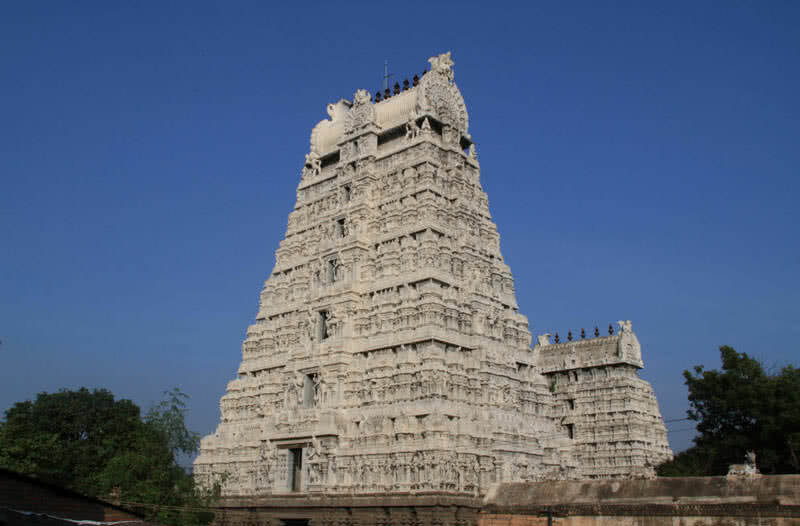 The Ekambareswarar temple is the largest temple in the holy city of Kanchipuram in Tami Nadu, dedicated for lord Shiva. The temple is one of ‘panchabhoothasthalam’ that represent Earth or Prithvi, one of the significant elements of nature. This enormous Shiva temple covers an area of 23 acres. Standing at a height of 59 meters, the gateway tower of the Ekambareswarar temple known as Raja gopuram. It is one of the tallest gopuras in India. The temple was built by Paranthaka Chola in 650 A.D. In the months of March and April, the Sun rays will directly fall on the main Shiva linga of Ekambareswarar temple. There are five different courtyards in the temple complex. The inner wall of the temple is decorated with 1008 Shiva lingams. Another attraction of the temple is a hall with thousands pillars known as ‘Aayiram kaal mandapam’. 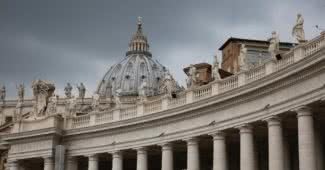 It is also said to be a hidden underground holy river flows under the temple. Annamalaiyar temple in Thiruvannamalai of Tamil Nadu is one of the grandest Shiva temples in India. This temple represents ‘Agni’, one of main temple of pancha bhoota stalas. The main Shiva linga of this temple is called as ‘agni linga’. 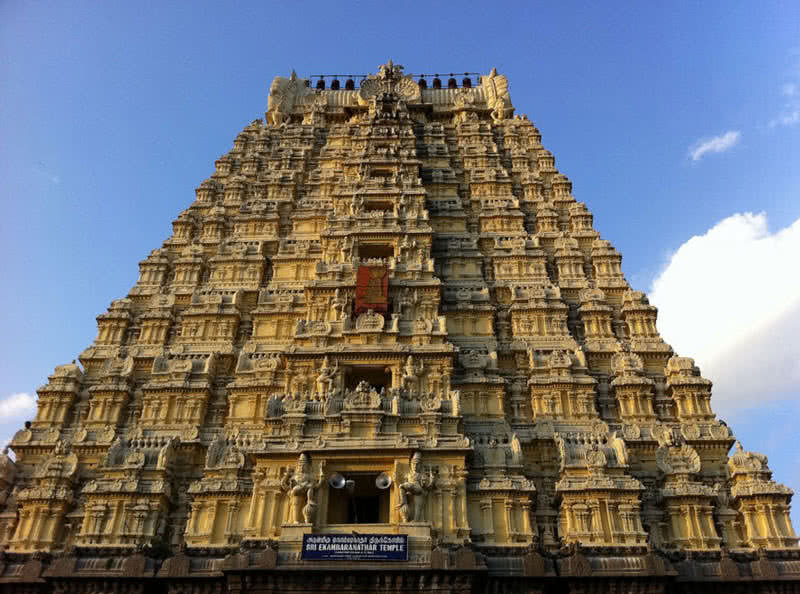 The Annamalaiyar temple is also called as Arunachaleswarar, one of form of Lord Shiva. The Goddess Parvathy is also worshiped in this temple as ‘Unnamulai Amman’. The present masonry complex and towers were built by Cola rulers dated back to 9th century. There are inscriptions of that time on the structures of Annamalaiyar temple.This temple complex covers 10 hectares of land. The temple houses many halls and four huge gateway towers. The tallest gateway tower in the complex has a height of 217 feet. There is also a huge hall with 1000 pillars built by King Krishna Devaraya of Vijayanagar. The towers and pillars of the temple also decorated with excellent sculptures. The Belur math is a magnificent temple and international headquarters of Ramakrishna mission founded by Swami Vivekananda in 1897. The most interesting feature of Belur math is it look like a temple, church or a mosque from every angle. The temple reflects a fusion of Hindu, Islamic, Buddhist, Rajput and Christian architectural styles. Belur math is also considered as a symbol of unity of all religions in the world. “The spiritual light that this place will emit will flood the whole universe” Swami Vivekananda said on the occasion of laying the foundation stone of Belur Math in 1898. The entire complex of Belur math covers a vast area of 40 acres. The Belur Math complex contains temples dedicated for Sri Ramakrishna, Swami Vivekananda and Holy mother, Sri Sarada Devi. The main gate of the temple features symbols of different religions. 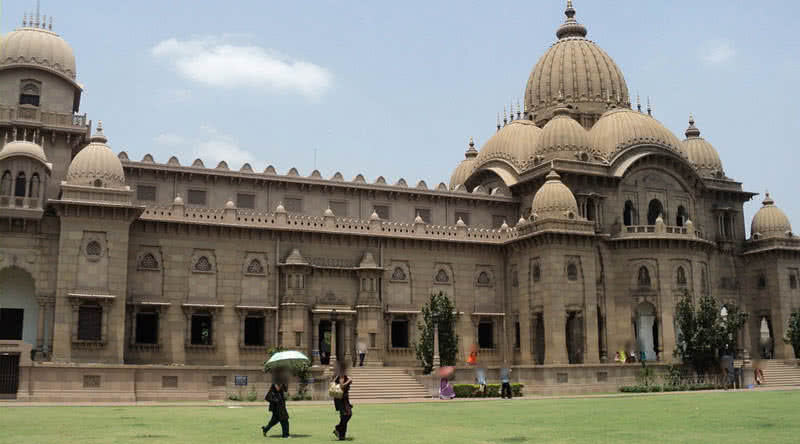 The museum of the Belur math also contains different artifacts used by Sri Ramakrisha and Swami Vivekananda. 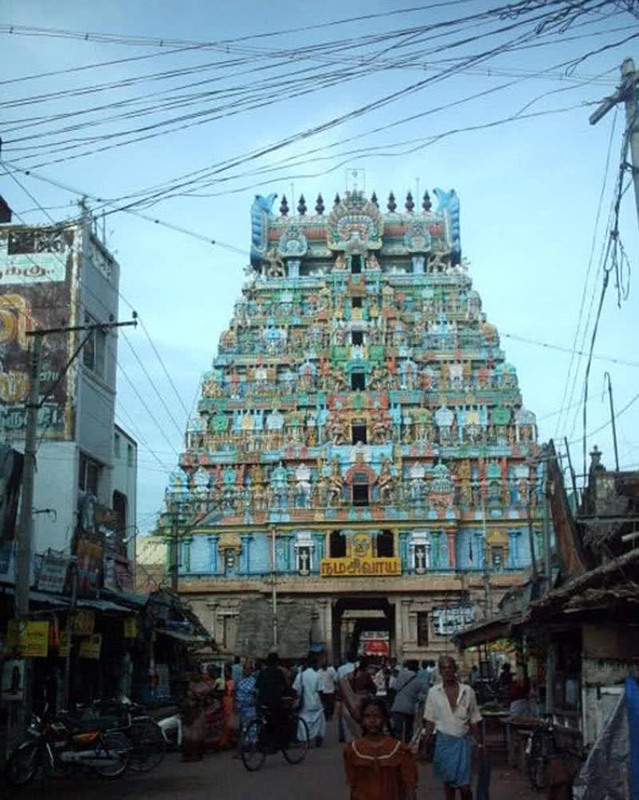 The Nadaraja temple in Chidambaram town of Tamil Nadu dedicated to Lord Shiva in in Anada Tandava pose (Nadaraja). Chidambaram temple is one of panchabhootha sthalams. This temple represents ‘Akasha’, the sky. This historic Hindu temple spread across an area of 50 acres. The Shiva linga in the innermost sanctum of Nadaraja temple is known as ‘Aakasha linga’. The sanctum also contains images of Lord Shiva and Goddess Parvathy. The temple was renovated by rulers of different dynasties including Pallava, Chola, Pandya, Vijayanagara and Chera in different period of time. According to the hypothetical believes t,he Nadaraja temple is located in the lotus of the universe known as ‘virat hridhaya padhma sthanam’. The main sanctum of the temple is a wooden structure known as Chitsabha where main Shivalinga is located. The golden hall located near chitsabha also contains images of Lord Shiva in ‘Urdhva Tandava posture’. The outermost prakaram or sanctum of the temple housed Sivakami (Goddess Parvathy) Amman temple, Sivaganga tank and a hall with a thousand pillars known as Raja Sabha. There are four main gopuras standing at a height of 250 feet and face four different directions. The magnificent towers are also decorated with 108 different poses of Bharata Natya and with images of Hindu mythology. The large Akshardham Hindu temple complex is located on the banks of Yamuna river in Delhi. The temple complex spread across an area of 100 acres. It is regarded as an icon of Hindu culture, art and spirituality. The central part of this religious complex houses murtis of Sita Ram, Siv Parvati, Radha Krishna and Lakshmi Narayanan. 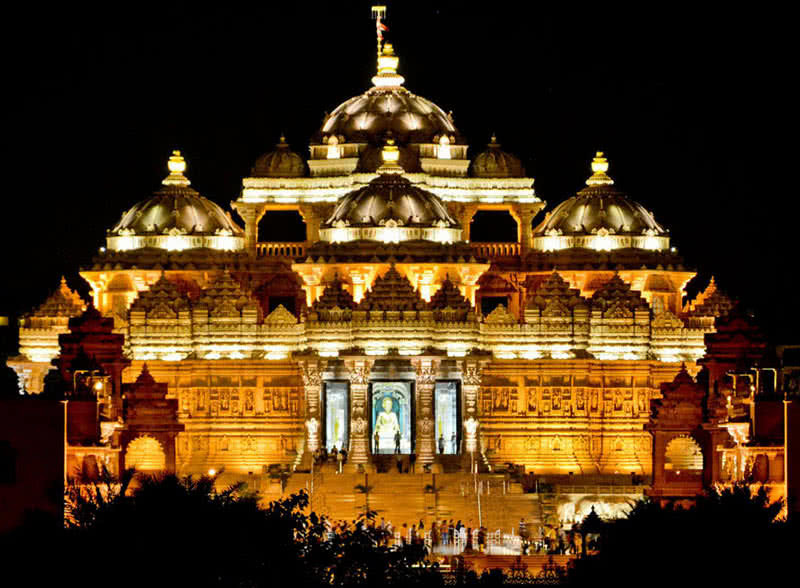 The Akshardham temple complex was built by Pramukh Swami Maharaj, The spiritual leader of BAPS organization.The Akshardham temple complex is entirely made of sandstone and marble. A magnificent gajendra pith of this temple symbolizing the animal kingdom. It features 148 full sized elephants, 42 birds and 125 human sculptures carved in pink stone. The 1070 feet long gajendra pith also represents a deep relation of ancestors of India and with nature. The main monument of Akshardham temple consists of 234 carved pillars and nine domes. It also includes the carvings of detailed information about Hindu deities, plants, animals and arts. Sri Ranganathaswamy temple is the largest Hindu temple in India. 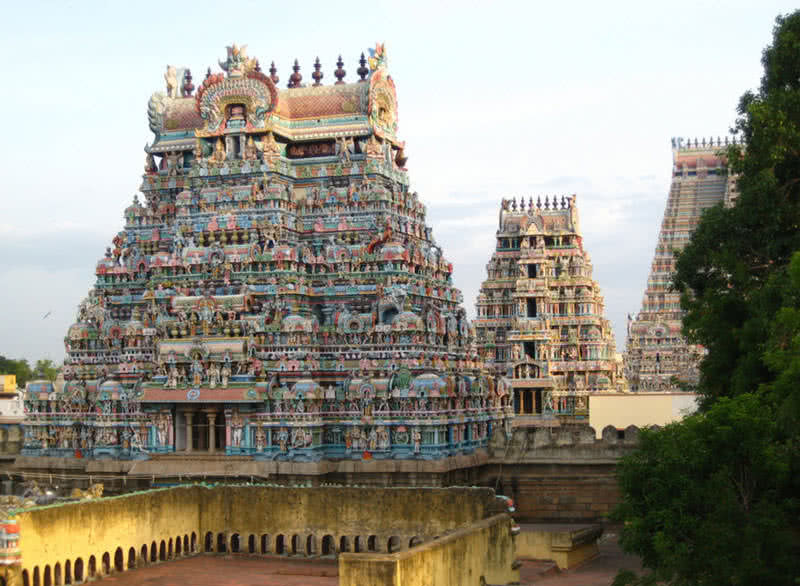 The vast temple complex was built across 156 acres of land in Srirangam of Tamil Nadu, India. The temple is dedicated for declining form of Lord Vishnu known as Ranganatha. The temple is also known as Bhoologa Vaikundam and Bhogamandalam. This magnificent Vishnu temple is also one of the finest Dravidian religious structures in India. The inscriptions from Sri Ranganathaswamy temple describe the role of Different dynasties including Chola, Pandya, Hoysala and Vijayanagar in the restoration and renovation of the temple. There are 21 towers and 39 pavilions in Sri Ranganathaswamy Temple. At a height of 236 feet, the main gopura of the temple known as Rajagopuram. It is the second tallest temple tower in Asian continent. This temple comprises seven enclosures formed by thick walls. The rampart wall encircles the golden plated main sanctum of the temple. The inner five prakaras as function as temple and the Non-Hindus are not allowed to enter main sanctum of the temple. A shrine over the main sanctum of the Sri Ranganathaswamy temple is known as ‘Ranga Vimana’ made in the shape of ‘om’,mythical sound of Hindu religion. There is also a hall with thousand pillars and decorated with sculptures. Stretching over a vast land of 500 acres, the Angkor Wat temple complex in Cambodia is the largest religious structure in the world. It is a UNESCO world heritage site and icon of Cambodia. The Angkor Wat consist of hundreds of stone temples and remains of the Khmer empire. This largest temple complex was built in 12th century by Khmer king Suryavarman II. 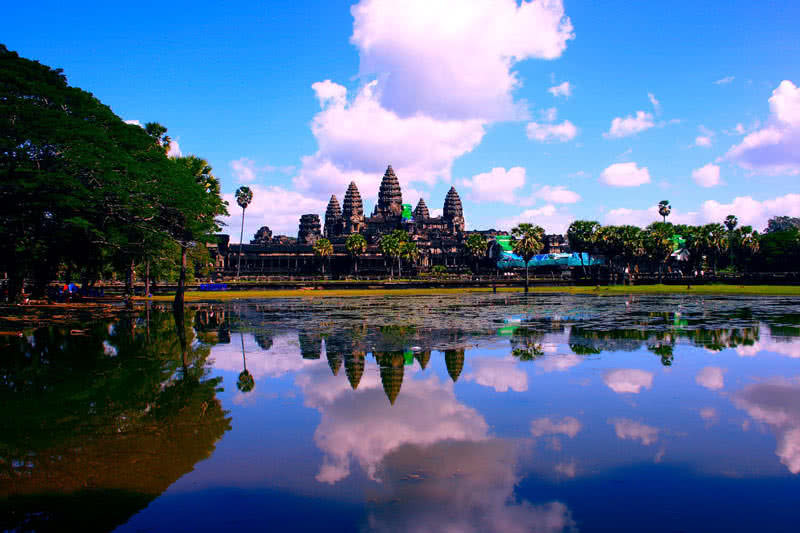 Angkor Wat was originally dedicated to Lord Vishnu and later, it became a Buddhist complex. Unlike other Hindu temples Angkor Wat faces the West. Archaeologists believed that Angkor Wat is not only a temple but also a mausoleum. The skilled workers of Saurvarman only used sandstones as main material for the construction of the largest religious complex. The Angkor Wat is actually a portrayal of sacred mountain mount Meru. The center tower of the temple stands at a height of 65 meters is surrounded by four smaller towers. The main entrance of the Angkor Wat on West side has rich decorations with sculptures and carvings. There is also a 3.2 meters high statue of Lord Vishnu made of sandstone. The central complex of Angkor Wat is a three storey structure. There are three main galleries in the central complex of the temple. Each gallery also has a lotus-bud shaped tower. The gallery of thousands Buddha houses hundreds of images of Lord Buddha. The inner wall of Angkor Wat is also decorated with important scenes from Hindu epics Ramayana and Mahabharata.